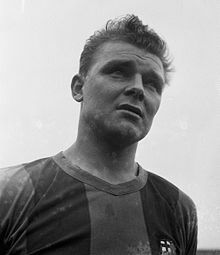 László Kubala (10 June 1927 – 17 May 2002) was a Slovak-Hungarian-Spanish football player. He has played for Czechoslovakia national team, Hungary national team and Spain national team. ↑ Strack-Zimmermann, Benjamin. "László Kubala". www.national-football-teams.com. ↑ "Ladislao Kubala Stecz - Goals in International Matches". www.rsssf.com.